Dante meets with Sonny to let him know Mac took him off the kidnapping case, because he’s not impartial. Sonny wonders what he can do to help, because he thinks Brenda will lose it if Lucian isn’t found. He explains that Brenda is second guessing herself and blaming his enemies. Dante figures since Lucian didn’t scream, he must have been lured and points the finger again at Suzanne. Sonny doesn’t understand why Suzanne would suddenly give Lucian to Brenda after three years of raising him. He knows that she&apos;s working an angle, but hasn’t figured it out yet. Dante asks about the adoption papers, but they seemed to have checked out. Sonny mentions the DNA test, and how it was supposed to happen the day after Lucian was taken. He soon realizes that Suzanne knew about the test. Ethan shares a drink with Luke, who claims he can stop drinking anytime, so Ethan asks him to stop after the first one. Ethan says he’s worried about him, especially when Luke doused the place with gasoline. Luke passes the buck to Lucky trying to make sense of things and blaming the booze, but he refuses to put that label on himself. Ethan wonders if that’s all Lucky needs, then why not tell him what he wants to hear. Luke explains that his father was a fall down drunk, who beat his mother and him. 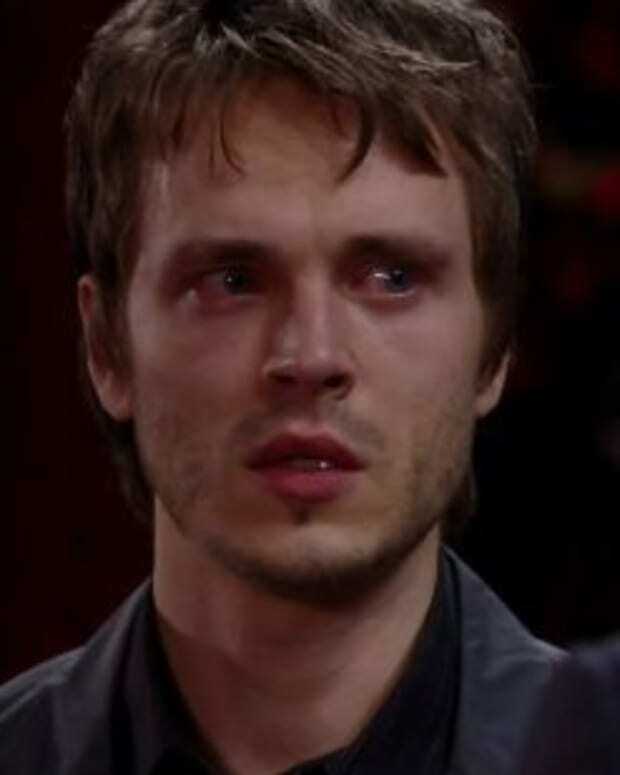 He goes on to inform Ethan that he and Bobbie eventually found their mother dead before their father took off for good. Luke is not his father and will not accept the label of alcoholic because if he were, he’d have killed himself long ago. Ethan points out that Tracy wouldn’t have participated in the intervention if she weren’t genuinely concerned. However, Luke feels that Tracy wants him to give up all his vices, not just the booze. Luke says that if he didn’t do it for Laura, he isn’t going to do it for Tracy. Ethan also points out that even if he’s not an alcoholic, he’s been more reckless than usual, pushing his family away and feels things need to change. Luke admits that he’s been behaving that way, because he can’t deal with having killed a child. Lucky and Siobhan, with Nikolas at their side, stand before the justice of the peace, ready to take their vows. Liz arrives and watches from the door. She has a flashback of when she and Lucky said their vows in the little church all those years ago. Liz watches as they are pronounced husband and wife, and leaves. Sonny tells Brenda that Dante will stay on the case to help the investigation and she’s happy because they can use all the help they get. She says Jax has offered to match their reward, but Sonny feels they shouldn’t offer a reward since it will give them false leads. Brenda knows he can’t write a list of his enemies for the police, but feels she needs to do something so she doesn’t explode. Sonny explains that the police will come after him, and he can’t take that chance. Brenda doesn&apos;t like Sonny&apos;s statement about the police one bit. Sonny deflects her by saying Dante might have a new lead, figuring that Lucian might have known who took him. Brenda’s angry that Sonny is pointing the finger at Suzanne, claiming she didn’t do it. Brenda figures Sonny wants it to be Suzanne, so that she’ll feel better that Lucian is in good hands. She knows that he wants them to can go back to their lives, continuing to take care of his kids because they’re the only ones that matter. Back at Lucky’s, Alfred has prepared cake and champagne. Nikolas apologizes for not being supportive of the wedding, but offers a toast to the happy couple. After, he heads out, because he has Cam and Aiden again, and Lucky thanks him for taking care of the kids. While waiting for Sam to get out of surgery, Jason has a dream about him and Jake checking out a real motorcycle. Liz comes running into the room, surprised to find him there and admits she needs to compose herself, so that Steve doesn’t send her home. She says it’s hard to turn off her mind and Jason admits to the dream and his sadness for all the things he’ll never get to do with Jake. He remembers the night of the bus crash and all of Jake’s questions regarding motorcycles. Liz reminds him that it’s Jake’s birthday today, and in his honor, Jason should go out on his motorcycle. When Sam wakes up from the surgery, Jason tells her there were no complications, but she’ll be in pain for several weeks. Sam wonders if it worked and if she can carry a baby. After Nikolas leaves, Siobhan’s putting away the wedding cake, when Lucky notices the date and realizes he&apos;s forgotten Jake’s birthday. He remembers he ordered a gift for him weeks before and can’t believe he’ll never see Jake’s smile again or blow out his candles. Siobhan tells him the good memories will eventually replace the sadness and that Jake will always be with him. She offers for them to go for a walk, but he says he’s happy where he is and they start to kiss. Ethan tells Luke that he’s glad he’s around and Luke admits he has demons. He knows he needs to find a way to keep them on a leash, and a drink now and then takes the edge off. Lulu shows up, wondering what’s going on and blames Luke’s bad influence on Ethan, but he says he’s chosen to be with Luke. Lulu tells her father that he doesn’t know his limits, and he needs the rush. She believes he needs to be in rehab. Luke understands that she’s caught in the middle but whatever she decides, he’ll always love her. Lulu wants her father to stick around long enough to walk her down the aisle, teach her kids about fishing and picking locks, and just to be part of her family. Lulu reiterates to Luke that he has a disease. Luke tells her she’s entitled to that opinion. Ethan claims he’s not going to judge his father, but Lulu is angry that he’s allowing things to get out of control and he’ll blame himself if something happens with Luke. Dante comes back to Sonny’s to tell him that he stopped by the airport and found out a woman and boy matching Suzanne and Lucian’s descriptions took a flight to Phoenix. Liz receives the gift from Lucky and opens it. It’s a red motorcycle and she “sees” Jake get on and ride it. Siobhan is getting ready for her wedding night. Liz shows up and gives the gift back to Lucky, saying she can’t keep it and doesn’t want it. Siobhan comes out of the bedroom and sees Lucky and Liz hugging.